Why do some nations become rich while others remain poor? Traditional economic theory has done little to answer this question. Now, through case studies from Asia, Africa, Latin America, and Europe, Making Poor Nations Rich argues for examining the critical role entrepreneurs, private property rights, and free trade and other economic freedoms play in economic development. This volume begins by explaining how entrepreneurs create economic growth and why some institutional environments encourage more productive entrepreneurship than others. The book then addresses countries and regions that have failed to develop because of barriers to entrepreneurship. Finally, the authors turn to countries that have developed by reforms that protect private property and grant greater levels of economic freedom. Making Poor Nations Rich demonstrates that pro-market reforms are essential to promoting the productive entrepreneurship that leads to economic growth, and where this institutional environment is lacking, sustained economic development will remain elusive. 13. Why Have Kiwis Not Become Tigers? Reforms, Entrepreneurship, and Economic Development in New Zealand. Why do some nations become rich while others remain poor? Traditional mainstream economic growth theory has done little to answer this questionduring most of the twentieth century the theory focused on models that assumed growth was a simple function of labor, capital, and technology. Through a collection of case studies from Asia and Africa to Latin America and Europe, Making Poor Nations Rich: Entrepreneurship and the Process of Economic Development emphasizes the critical role that entrepreneurs, private-property rights, and economic freedom play in economic development. Making Poor Nations Rich begins by explaining how entrepreneurs create economic growth and why some institutional environments encourage more productive entrepreneurship than others. The volume then addresses countries and regions which have failed to develop because of barriers to entrepreneurship. Finally, the authors turn to countries that have developed by reforming their institutional environment to protect private-property rights and grant greater levels of economic freedom. 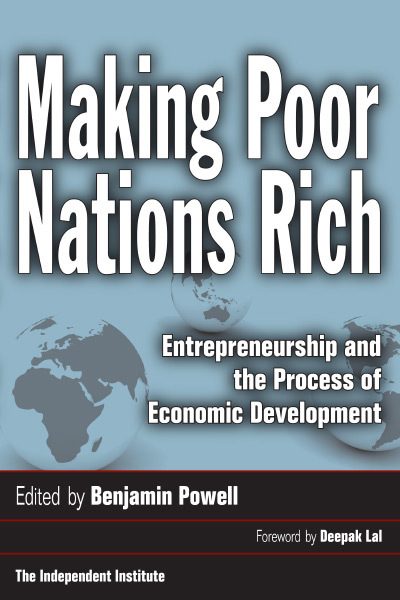 Before showing how institutions affect entrepreneurship and economic performance, the late Mancur Olson Jr. in chapter 2 dispels the notion that differences in resource endowments, physical and human capital, or access to current technology explain why disparities between rich and poor nations persist. Instead, the main culprits are counterproductive laws, public policies, customs, and attitudes that affect the profit opportunities available to entrepreneurs. Entrepreneurs play both a direct and indirect role in fostering economic progress. By innovating, an entrepreneur creates new opportunities for other entrepreneurs, setting in motion an upward spiral of specialization, productivity, and wealth creation, explains Randall G. Holcombe in chapter 3. Unfortunately, not all entrepreneurship is economically productive. William J. Baumol shows in chapter 4 how institutions can discourage entrepreneurs from introducing new products or new methods of production to instead encourage them to pursue nonproductive activities, such as lobbying government officials for special subsidies or protection from competitors. Baumol illustrates this point with examples from ancient Rome, medieval China, and Europe from the Middle Ages to the Industrial Revolution. Which institutions best foster productive entrepreneurship and material progress? In chapter 5, Robert Lawson systematically reviews the case for economic freedom and property rights. He concludes that more property-rights protections, personal choice, voluntary exchange, and free entry into markets lead to higher per capita income, faster economic growth, more productive entrepreneurship, greater foreign and domestic investment, better access to safe water, and longer life expectancies. He also finds that poor countries that move toward greater economic freedom and better property-rights protections tend to improve faster than rich countries that dont improve their institutional environments. Barriers to entrepreneurship have impeded economic progress in many of the worlds poorest regions. Sub-Saharan Africa has actually become poorer since gaining independence, as many countries have become vampire states that enrich their rulers but drain the lifeblood from productive indigenous institutions, argues George Ayittey in chapter 6. The West could help Africans bolster local entrepreneurs and attract investment by ending aid to kleptocrats and encouraging reforms that strengthen property rights, the rule of law, and economic freedom. Similarly, many of Latin Americas leading institutions, from the colonial era to the present, also hamper productive entrepreneurship, explains Alvaro Vargas Llosa in chapter 7. Many governments in this region initiated reforms in the 1980s and 1990s, but failed to reform the institution that needed it the most: the politically dominated judiciary. Making the courts more independent would establish a climate more conducive to investment and wealth creation, argues Vargas Llosa. Europeans have also labored under institutions that inhibit productive entrepreneurship. In Romania, entrepreneurs have shied away from making significant investments, because the countrys regulatory framework has been reformed too often since the fall of state socialism, explain Peter J. Boettke, Christopher J. Coyne, and Peter T. Leeson in chapter 8. Regulatory uncertainty and rampant bribery have driven many capable people to seek employment in the government bureaucracy, rather than become productive entrepreneurs. In Sweden, a bloated regulatory-welfare state has led to low rates of entrepreneurship and lackluster economic growth, argues Dan Johansson in chapter 9. High taxes, compulsory savings, and very burdensome labor-market regulations discourage or even prevent new firms from hiring employees. While many countries have failed to strengthen private-property rights and expand economic freedom, others have done so and consequently have experienced faster economic growth. China still ranks low in international comparisons of economic freedom, but its score in 2002 showed a 66 percent improvement from 1980. In chapter 10, James A. Dorn describes Chinas institutional environment, its economic performance, and areas needing reform, such as financial regulations that favor state owned enterprises at the expense of private entrepreneurs. Although much of Indias economy remains heavily regulated, this fast-growing country has also significantly expanded economic freedom. In chapter 11, Parth J. Shah and Renuka Sane discuss Indias reforms and the regulatory and societal changes needed to enable entrepreneurs to bring Indians more economic benefits. Over the past fifty years, Ireland has enjoyed a far higher standard of living than have China and India, but by European standards it was considered underdeveloped. In the late 1980s, however, its economy began to experience dramatic growth. In chapter 12, Benjamin Powell argues that large cuts in both taxes and government spending fostered increases of foreign direct investment and entrepreneurship, which led to Irelands economic rebirth. New Zealand is another relatively developed yet underachieving country where crisis led to reform. In chapter 13, Frederic Sautet attributes New Zealands economic turnaround since the mid-1980s to cuts in marginal tax rates, greater flexibility of labor laws, trade liberalization, and monetary restraint. Despite improvements, however, New Zealands growth is still hampered by high tax rates, tariffs imposed by potential trading partners, and excessive regulation of labor and industry, according to Sautet. Botswana is a noteworthy exception to the African economic malaise. After gaining independence in the early 1960s, it cut the size of government significantly, transforming the nation from one of the worlds poorest into an upper-middle-income nation, explains Scott A. Beaulier in chapter 14. In recent years, the formation of interest groups has led to an increase of government spending, financed largely by revenue from diamond mining. If that revenue source dries up, as some predict, higher taxes and slower economic growth may follow. Benjamin Powell is Research Fellow at the Independent Institute and Professor of Economics at Suffolk University. Dr. Powell received his Ph.D. in economics from George Mason University and his Bachelor of Science degree in Finance and Economics from the University of Massachusetts at Lowell. He has been assistant professor of economics at San Jose State University, a fellow with the Mercatus Centers Global Prosperity Initiative, and a visiting research fellow with the American Institute for Economic Research.